You might think that night light technology hasn’t come very far in the past decade, but we’re about to show you something awesome that will definitely change your mind. Instead of using a boring old night light that plugs into an outlet and stays on all night long, check out the Vansky Motion Activated Bed Light. It’s a flexible LED strip that you install under your bed, and it’s motion activated. This way it casts a soft glow from under your bed right when you put your feet on the ground, but it shuts off again once you go back to bed so it won’t disrupt your sleep. 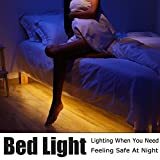 ☑️ Smart Nightlight — Warm soft glow of bed light will turn on to guide you safely across the room in the dark, no disturbing glare to wake others. Power Saving; Only light up when it picks up your movement, auto shut-off after leaving, further improve power efficiency and save energy. ☑️ Motion Activated — Built-in human body passive infrared (PIR) motion sensor light with automatic shut-off timer. Automatic Turn on and Shut off by human induction in the dark environment. Inductive range: 3.6m (11.8feet), 100°. ☑️ Adjustable Time — Motion sensor Auto shut-off timer can be set from 30 seconds to 10 minutes. Continue Triggerand System to keep the light on and automatic turn off within 30 secs- 10min after leaving. ☑️ Multi Purpose — Safely guide you through the dark. Can be installed in anywhere you need extra light. Not only act as under bed lamp, but also covers a wide range of home applications like stairway, cabinet, cupboard, sofa, furniture etc. ☑️ Quality Assurance — Highlighting-brightness 45 LEDs Last Up to 100,000 LED Lighting Hours. What you get; Vansky Motion Sensor Light, Activated sensor, Power adapter, Extension cable ,User manual, Together with 45 Days Money Back, One Year Guarantee and Friendly, Easy-to-reach Support.